1- Use your dies as backgrounds like I’ve done here with the Poinsettias. 2- Embellish with same die-cuts to continue the look. Only other embellishment add-on here are the gold flat-back gems. 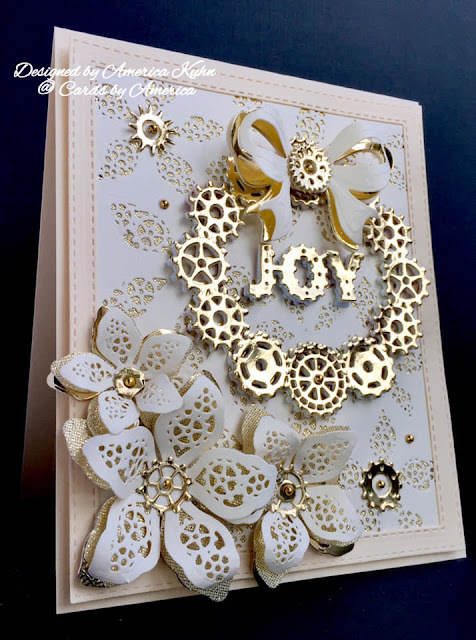 3- Back your die-cuts with large wide ribbon cuts or pieces for texture & accents. 4- Use the ribbons to die-cut Flower Layers like I’ve done here with the 3 Poinsettias. 5-Die-cut frames to size & place these over your backgrounds to close off the cut edges and clean-up the look. Extra tips; Use your extra Manila folders laying around for card bases & to layer-up your die cuts for depth & dimension. The sturdy thickness is perfect and cuts beautifully. May save you $$ too! Sometimes i will also use craft foam sheets for added dimension. They will stretch when die-cutting but bounce back into the cut shape. Foam Sheets work beautifully for layering too! If you look closely at underlayers, you’ll notice I’ve used both here. ARE YOU a Creative Expressions Sue Wilson FAN like me? Then check us out on Facebook. We have a great inspiring group of crafters like you who also interact, share ideas, tips, tricks, tutorials, and fabulous makes using Sue Wilson products! Find our Facebook group HERE and hurry to join the fun so you dont miss anything! "Sue Wilson Fans in the USA and around the Globe"
Sue Wilson also has an Award Winning Blog of her own! That's right! It is called Participate In Craft - or PartiCraft. She posts daily samples using her incredible products so be sure to check it out for more great ideas! Find it HERE! That’s it! Hope you’ll give these ideas and tips a try! Thanks for stopping by today! I love hearing from you! Just gorgeous America and some VERY GOOD tips you have shared! Always a pleasure to see your creations! Merry Christmas to you & yours!! Thanks so much for playing in our ‘Christmas’ challenge at Dies R Us. Good Luck and please come back again soon! Lovely card America. I am sure your card will bring Joy to anyone receiving your Christmas wishes. Thank you for participating in Creative Crafters "Anything Goes" Challenge. Merry Christmas. Stunning! Thanks for playing along at Archiscraps. Lovely gold and white card. thank you for joining MIUCB challenge. What a gorgeous card-love your tips! Thanks for joining us at Die Cut Divas! Wow I love your Die Cuts project it looks absolutely gorgeous and absolutely fantastic. Lovely work, the final finished creation is amazing. Thanks for joining us at Archiscraps. This looks beautiful. Just love this great Christmas card . Thank you for sharing with us over here at "A Perfect Time To Craft" and best of luck with your entry. WOW! I LOVE how you have mixed styles up with your dies, this is an awesome card and so VERY Beautiful too. Thank you so much for joining us in our Morgan's Artworld Open Challenge at Morgans Artworld this week. We would love to see you again in our next challenge. Oh my gosh, I LOVE this card, clean crisp and so beautiful. So glad you joined us at Die Cut Divas. Wow.. what an amazing Christmas card! Really stunning. Love that you used so many gold on your card. Thanks for playing along with us at our present challenge at Do-Al(l) Kreatives and good luck. Hope you will join us next month again. Please keep in mind that you have to be a follower in order to win the prize. When you already following us everything is fine. Beautiful creation! Thank you for sharing with us over at The Creative Crafters. We hope to see you again. Fabulous creation! Thank you for sharing with us over at Morgan's Artworld Open Challenge and best of luck with your entry. Love to see you join in each month. Thank you. Thanks for playing along with our Do-Al(l) Kreatives Challenge and good luck! Hugs and please come back soon! Love the wreath on this card and the touch of gold. Thanks for joining us at Archiscraps. Love your make!! Thanks for the tips! Thanks for sharing with 12 Months of Christmas Link Up! DT for The 12 Months of Christmas Link Up! Great concept and original, too! Thank you for sharing with us over here at "A Perfect Time To Craft" and best of luck with your entry. Your card is gorgeous! Lots of wonderful detail and pretty color combo! Thanks so much for joining us at Dies R Us for the challenge!